This post is about maximizing visual clarity of a page, not SEO. The page will be displayed on a 1080p 42" television. Users will be standing 3 - 6 feet from the TV. 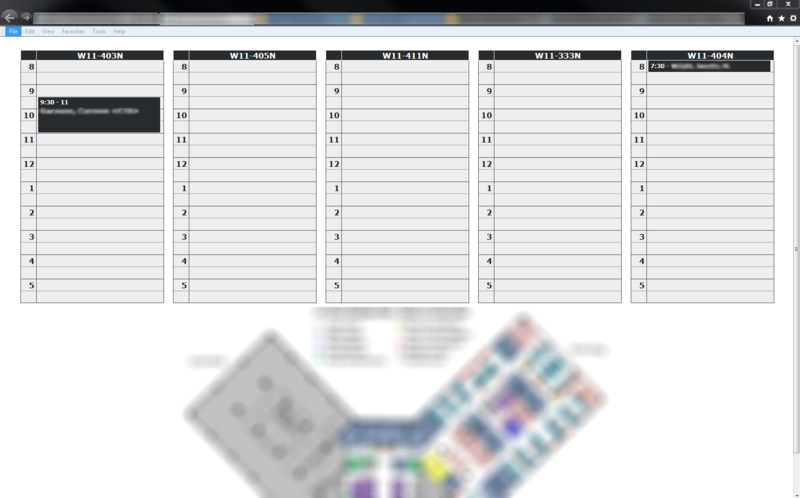 The page holds six calendars, displaying reservation times for six rooms. This layout is a client request -- assume it can't be changed. My first thought was to make the page high-contrast using extreme grayscale colors (see image below) but my client finds the current design too harsh and would like some color added. I have searched for high-visibility design principles with little success. All advice welcome. Notable highest contrast using solid white may not be best approach. Reds & oranges can be problematic. Not the answer you're looking for? Browse other questions tagged accessibility contrast design-principles visibility displays or ask your own question. Drawer Menu (hamburger) icon visibility, no background?